Buy Rory’s Story Cubes. Story Cubes rock. Do I really need to write more than that? Firstly, like the BBC, I’ll go all non-partisan and declare that other methods of random story element generation exist and you’re free to pick them up and use them. Far be it for me to cramp your creative stylings. I suspect some people will look at me aghast for suggesting the Cubes in the first place like some panacea for the creatively blocked. Others will nod sagely and see this as nothing more than a sales pitch. I’d be the first to look through squinty eyes at an article that just said, “Buy something”, without any qualification. Small print aside, I love my Story Cubes in a way that isn’t odd. I don’t carry them around with me all the time. I don’t keep them under my pillow (that’s where I empower my rune stones… there’d be no room). If I need Story Cubes on the go, there’s an app for that. I keep my Cubes on my desk where I do my writing at home. In the last week, I used them to come up with a quick adventure, enhance the backstories for some player characters and add elements to an article for The Iron Pact. I’ve also used them in the past to write a whole article and associated adventure, Best Left Unspoken. I keep a selection Cubes in a bag or at least some of them as I have enough to fill two average-sized dice bags. 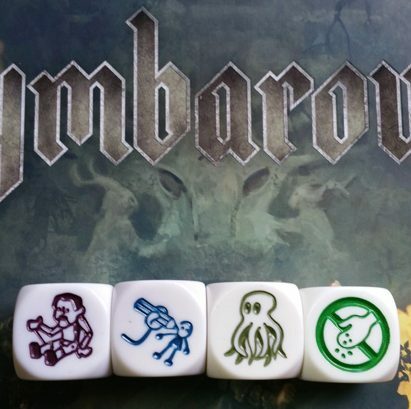 Rather like selectively choosing creatures to fit an adventure or qualifications to fit alongside a job application, Story Cubes work best if you thin them out and select only those with some reasonable connection to your subject matter. With a bit of imagination even a man in a space suit or a laser pistol will fit a fantasy game – travelers from distant lands and powerful artefacts – but with so many sets all those tangential possibles don’t make sense to keep around. When I need to drop a creative bomb, I reach into the bag and pull out three to five dice. Story Cubes can provide you with the whole background on a character or just the whole character. The individual might be a messenger or a poacher, or the trap and parcel might suggest a bounty hunter; the bottle and parcel could be an alchemist out to find the perfect gift for someone else. You might see symbols that suggest personality traits, motivations or current activity – so the character might be testing a new elixir and seeking test subjects or might be travelling far and wide in pursuit of a lost package. The central symbol might mean undecided, lost, erratic or aimless. The left parcel might mean generous while the right suggests a hoarder or someone unwilling to readily give up what they know or possess. Combining more than one element together could present an encounter suit to filling time between longer adventures or as a one-shot on a week with some players away. Here you may wish to consider what the characters already know or what plans they might have. The motivations, dependency, goals and prejudices of the characters can combine with one or more die for a more fulfilling and engaging tale. Drawing on that alchemist / mystic example, the characters might come across a woman wandering the Bright Davokar searching for something. She explains the need for a specific herb and describes it, but the level of detail and personal objectives of the characters probably won’t give leeway to help. She might offer a gift in return for helping – perhaps a portion of the elixir – but she doesn’t have any money to offer for the traveler’s time. The ear or favour of a capable alchemist might prove useful, as would the eye of one if searching for some other herbal source. Persuasion might reveal the reason for the search and that discovery might fit in with, or work against, the character’s plans. When the same alchemist emerges later in the adventure, lost and bewildered, she might have got what she needs but not feel equipped to get back to civilisation. Now she will offer something more substantial – and if accepted it turns out that another party has attentions on the prize and have laid a trap to take the harvested plant for themselves. Maybe even Mayor Lasifor Nightpitch might have his eyes on that prize, not wanting anyone else to emulate his own rise to high office through a feat of miraculous recovery. Could Nightpitch bring the characters in for questioning later, having heard they witnessed the alchemist’s search? Or, perhaps she turns up dead and they’re held to blame when rangers discovered a scrap of paper on her body with a character’s name scribbled on it. The last section suggests how you can add a new and impromptu thread to an adventure, but there’s no reason why you can’t roll the Cubes to create the core of an adventure itself. The example, above, could cast a member of the character’s group in the roll of the alchemist in search of the herb for an important client. In turn, the party can become lost, face one or more random encounters, before finally facing lackeys sent by Nightpitch to gauge their well-being, check their licences and assist their return to civilisation. Once you’ve rolled the dice, don’t allow the order to constrain you. Move them around. If you use the Story Cube application, drag the dice around and reorder them. On the tabletop, pick them up and do the same. Like finding words in Scrabble, switching the order helps keep the brain engaged. Stick them in one spot, the creativity won’t kick in completely. The order might impose barriers on your thinking – like that big damned star in the middle that keeps making me think of the Warhammer symbol for chaos. Move them. Group them. Re-order them. Heck, if you’re really struggling to interpret something, re-roll it. Or pick another die out of the bag. Maybe a gift happily offered and a burden carried with caution seems too close a concept and you want to try something else. Take the one that appeals least and just throw that die again. Make notes. Write your thoughts down. Make it random and unordered, not making any connections until you’ve taken a long first pass. In this case, you might want to write about what associations immediately come to mind. Note single words and short concepts. Presents, celebrations, bearing gifts, handle with care, it’s a trap, unexploded bomb—and so on. You might choose to create connection mind maps – heck, turn the dice into nodes on the paper and draw lines between them. If you go with the nodes, you create a distinct break between each die and then slowly drawing them back together with commonality and connection. You can extend this principle by inserting the names of characters or key personalities and places you want to see features in the adventure. Who hired the messenger? Who laid the trap? Where do the characters lose their sense of direction or purpose? Could easily be repurposed for Symbaroum. As so few Ambrian cities are described, this could offer GMs an easy way to instantly visualise them.